Link Arrows on "Decode Talker" in the anime. Link Arrows, known as Link Markers (リンクマーカー, Rinku Mākā) in the OCG, indicate where a Link Monster points to. Only the red arrows around a Link Monster's art frame are Link Arrows. The number of Link Arrows a Link Monster has is its Link Rating. Link Arrows are not card effects and cannot be removed while the Link Monster is in a Monster Zone. 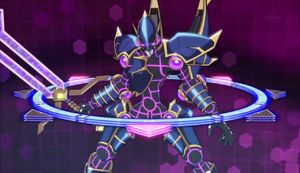 If a Link Monster is in the Spell & Trap Zone, it is not treated as a Link Monster; therefore, it does not have Link Arrows and cannot point to anything. This page was last edited on 16 April 2018, at 10:23.